Citizens of Skopje learn to breathe on gills and each year Skopje breaks records in pollution, but still, ecological transport is not climbing a ladder up to the top priorities. Hence, the development of cycling structure and culture must be imposed as a significant segment of establishing sustainable transport model, as befits a city with European aspirations. Cycling does not burden the city budget and saves long-term on roads, parking lots and public transportation. It offers economic benefits by developing bicycle tourism, sales of bikes, their parts, service. Non-motorized transport does not generate noise, fumes, and security aspect is also important. Experiences show more terrible damage and consequences of car accidents than bicycles. More cyclists means less cars, less congestion and generally less traffic accidents, which annually have an average of 160 fatalities. One third is in Skopje. In 80 percent Skopje is a flat city, it has a solid climate and an average temperature of 13.5 degrees Celsius. It covers 1818 square kilometers, it is about 20 km long, with a chess set of boulevards and small traffic arteries. But so far all these prerequisites have not given tangible results for it to grow into a functional bicycle city. 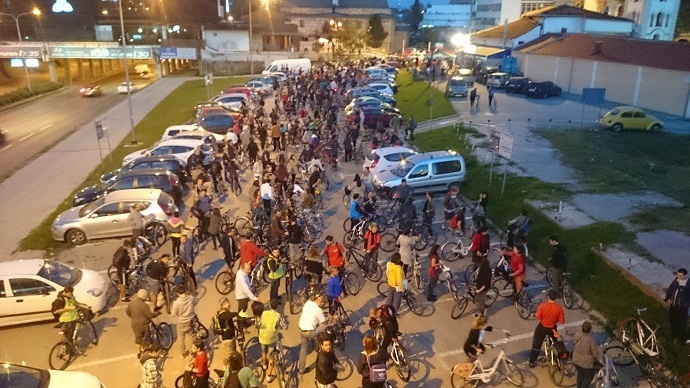 Skopje cyclists seek strategic feasible solutions and equal treatment with motorized transport. Widened streets are no good if cyclists are marginalized, without an organized road network that is now repaired if necessary, from campaign to campaign. Patching potholes is short-term and is not part of the whole city picture. The budget of the City of Skopje for 2015 “weighs” about 90 million Euros, it will be primarily focused on designing facades, squares and streets, while about 163,000 Euros will be allocated for upgrading the cycling network. 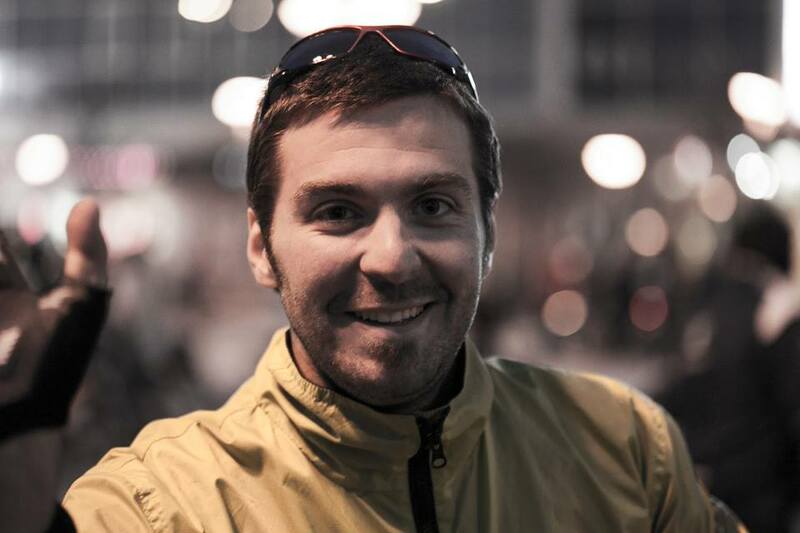 “In Skopje the biggest problem is the occupation of the entire public space. The city is primarily designed for 250,000 people, and now it has about 700,000 citizens with their needs for movement and transport. Public space is overcrowded with cars, especially sidewalks and red cycle lanes. In 2010 legislative measures were adopted on imports of second hand cars, after which 50.000 arrived and earlier, in 2009, there were only 3,000 such vehicles. Unofficially, in Macedonia there are 400-500.000 registered vehicles, of which one third are in Skopje. On average, cars are 11.8 years old, and every person from Skopje daily travels an average of 2.1 km”, says Nikola Neskoski, president of the NGO “Eco Logic”. On the other hand, Neskoski reminds that every day nearly 100,000 people travel from the periphery to the central area, and the ring road that has been built, as he says, rather than reducing the traffic to 30 percent, is dysfunctional. A serious current problem is the so-called expansion of Skopje streets. According to him, wider the streets, more cars, more air pollution and congestion. No matter how much the streets are spread, there will never be enough space for vehicles without previously arranging the cycling infrastructure. Without appropriate cycle lanes, signaling and distinction with pedestrians, it is no use to all traffic participants. Skopje is not a monopoly of cars. “Adding lanes on the street to deal with traffic congestion, is the same as loosening the belt to deal with obesity. Through the technique “road diet” a lane from the streets to be given to public and non-motorized transport, bicycles, and then through the technique “push and pull” citizens to be discouraged to use cars through increased taxes, restrictive parking areas …”, Neskoski proposes. In many places there are no such lanes at all, in some places they are merged with pedestrian zones, lines are faded, they are completely cracked, or rather than drawn horizontal lines, red behaton tiles are used. On the reconstructed “Boris Trajkovski” there is a red lane only one meter wide, though, legally, a bicycle requires at least 1.25 meters in one direction. Plus, there is rarely a sidewalk without a parked vehicle whose owner has left it with an argument “I’ll be back in 5 minutes.” At the same time, a city as Skopje has only 10 tow trucks of PE “City Parking” and “POC”. Cyclists think that the longest lane along the River Vardar from Vlae to Aerodrom is solid, but it is not connected with the traffic structure. At least another 8-10 entries are necessary. At the moment it is not part of the transport flows, it serves only for recreation. Friendlier bicycle environment requires attractive and comfortable lanes that generate less stress and are lighted for night tours. “It is not enough just to asphalt a certain surface and to call it a cycle lane. The underlay needs to be well pressed and the asphalt flat, not wavy. To have a standard width and color, and not standard distance in relation to the street and a clear separation of the walkway just on paper. Visible horizontal and vertical signaling, no obstacles along the lanes. To introduce “Zones 30″ where there are no conditions for separated cycle lanes. To set bicycle parking in front of all public institutions”, it is stated inter alia in the last letter of the informal association “On bicycle” to Mayor Koce Trajanovski. This civil initiative has been existing for nearly three years. 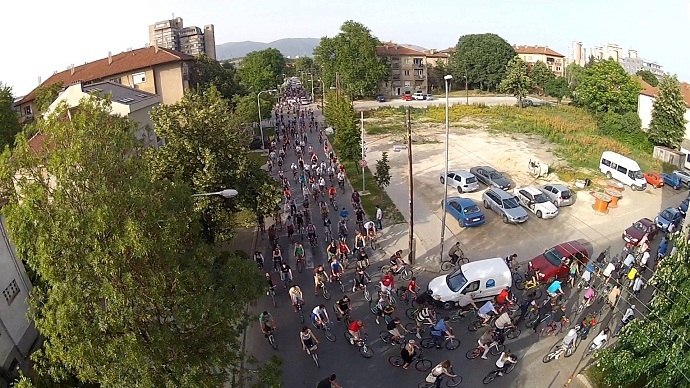 Every last Wednesday of the month it encourages the so-called “critical mass” where cyclists ride through the streets in order to direct to the basic conditions and problems for development of cycling. This mass cycling event takes place in 300 cities worldwide and is a gathering where there are no leaders and there is no formal organization. The gatherings have often resulted in inventive pressure, changing views and policies of the authorities towards cycling. Excellent topography of the terrain and climate in Skopje allows active bicycle tourism almost throughout the year. A group of creative enthusiasts allow active form of visits and experiences of the city and the surrounding area. From the Old Bazaar, through Kale, visiting museums, historical sites and records, biking and day trips to the cave paintings and galleries around Matka, the Roman aqueduct. 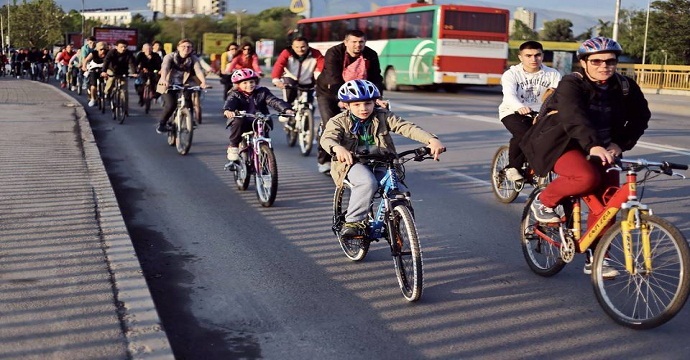 Then bike tours around Vodno or climbing Skopska Crna Gora and “rinsing” the eyes of the sunset from Ljubanci… Bicycle circle “Milton Manaki” has been established recently, through which bicycle gatherings are organized of educational and cultural character. “There are local roads, landscape value along these roads, there are cordial people that are glad when meeting a foreigner, will talk to him…Having potable water in our streets is very useful. These are beautiful things. But bike tourists do not know where to go. The whole country can be passed in two days, with an overnight stay. And, simultaneously, Skopje is often bypassed. They do not know where to drive and what to see”, says Bojan Rantasha, bike guide, part of the platforms “bicycle.mk” and “to4ak.com”. To be seen in terms of economic benefit and create a foundation for bicycle travel product, we must first mark, set signaling and connect the existing bicycle infrastructure with attractive places. According to Rantasha, tourists seek overall European uniformity of road signs. In Skopje, as he says, come mainly independent cyclists and tours going through Kosovo. To get to Kachanik they must pass through Skopje. About 80 percent of individual tourists “cling” to the southern part of the country, for the simple reason that the city has no maps! “He comes to Skopje, gets a bike from the service PE “Public Parking” or through his hotel or hostel and then asks for a map in the Info-station of the City to go to interesting places. However, there is no map how to get to Matka, Marko’s Monastery, Katlanovo… There is no tourist map for Vodno! How to get there, where to turn…? !, says Rantasha. According to him, besides the lack of duly marked red lanes, bicycle corridors are focused mainly on the central area. There are no such in Drachevo, Radisani, Chair, Gjorce Petrov, Saraj …There are small streets, so you can detour to get to a certain location. 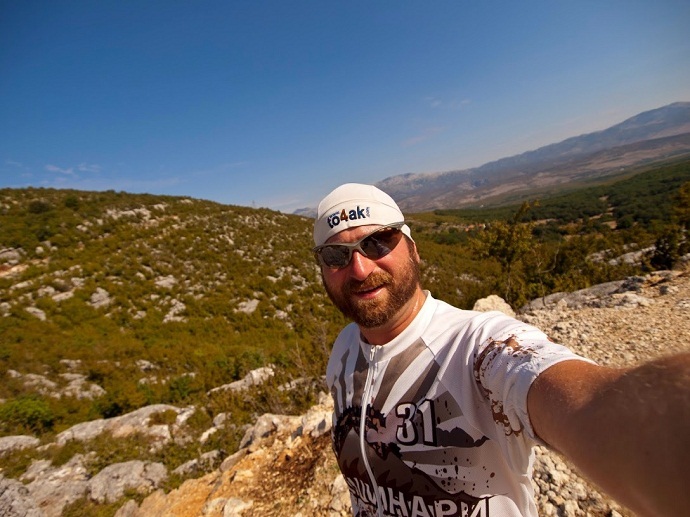 At the same time, if looking for an alternative to go to Matka through the villages Krushopek, Grcec, to pass through the rural area, the cyclist will run into an illegal landfill, bigger than once “Vardariste”. A truck will come and “empty” on the road over Nerezi. From the Ministry of Environment, according to reports from the past two years, they confirm that at state level, road transport accounts for 28 percent of nitrogen oxide emissions, 34 percent of the total emissions of carbon monoxide, 16 percent in organic substances, and in terms of solid particles with only 2 percent. They say that households have a much larger share in the dangerous dust PM 10. Most nitrogen oxides are generated by the traffic and potential measures to motor vehicles would reduce these pollutants. “Every free space should be used for planting grown trees that will absorb a large quantity of exhaust gases. You have to go on foot, go by bike – yes, go by car only when you need. We have counted at the crossroads – every 11th and 12th vehicle has two people, and others have a driver only! From this we conclude that we are a rich nation”, said Svetlana Gjorgjeva, Head of the Macedonian Environmental Information Centre at the recent debate on air pollution.